With beginning of the season, Pandaw sets new standards in not just visiting, but experiencing the countries we visit. 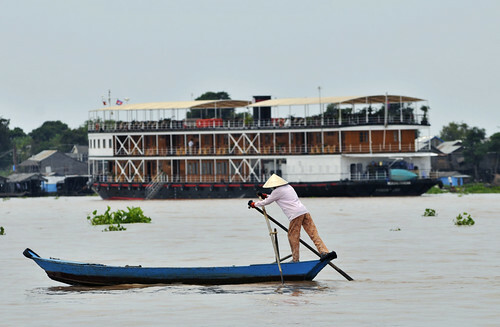 Excursions are “all inclusive” including admission fees, cool drinking water and a maximum of 24 passengers per group on all Mekong departures. We use deluxe sampans, buses, cyclos, ox carts and our comfortable Pandaw Explorer boat to visit the unique floating villages on the Tonle Sap Lake. This year we have added new excursions on selected departures: The visit of Ba Phnom mountain, one of the first religious and cultural sites in Cambodia and may be considered a birth place of the Cambodian nation; Koh Dechou island, a remote Mekong island famous for its homemade noodles, but rarely visited by foreigners; Our visits to Battambang, its much-talked-about circus and the very curious bamboo railway; and the famous Prek Toal, a virgin freshwater swamp forest and bird sanctuary. 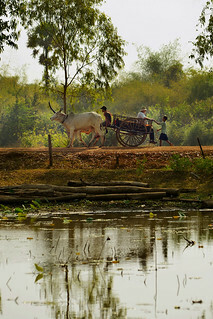 Meet real Burma, Vietnam and Cambodia. Off the beaten track. Find yourself among villagers roasting rice, weaving baskets or fishing with nets. Experience local life, while taking an ox cart ride through picturesque countryside or a cyclo ride through bustling Phnom Penh. Walk through villages, visit Pandaw Charity projects, floating markets and hidden temple ruins, receive a Buddhist blessing by a monk in a pagoda or get thrown into a “National Geographic Documentary”-feeling while cruising by small boat through the back waters and mangrove forests of the Mekong Delta. Our expeditions have a local link. We visit communities with respect and do not support mass tourism creating begging children or destroying cultures. We stop at least once a day, usually twice. Our excursions are not compulsory, enjoy the ship and the sun deck if you prefer. After each exciting excursion, your Pandaw crew will be waiting for you onboard, clean your shoes and serve a welcome drink and cold towels. Lean back, relax and enjoy the sunset before dinner.